(2009) "I'll Go Crazy If I Don't Go Crazy Tonight"
"I'll Go Crazy If I Don't Go Crazy Tonight" is the fifth song from U2's 2009 album No Line on the Horizon. The song was released as the album's third single in a digital format on 25 August 2009 and in a physical version released on 7 September 2009. Two music videos were made, one directed by David O'Reilly, and one by Alex Courtes. The band collaborated with will.i.am in the creation of the track; will.i.am receives an "additional production" credit on the finished version. It was first developed by Brian Eno under the title "Diorama" during a break in the recording sessions. The band reworked the track under the new title of "Crazy Tonight" before retitling it again as "I'll Go Crazy If I Don't Go Crazy Tonight". Several of the song's lyrics were influenced by Barack Obama's presidential campaign. Bono stated to Q magazine that the lyrics "[sound] like a T-shirt slogan to me", also noting that it was No Line on the Horizon's equivalent to "Beautiful Day". "I'll Go Crazy If I Don't Go Crazy Tonight" was first played on 4 March 2009 on the Late Show with David Letterman, one of three performances of the song during No Line on the Horizon promotional appearances. The nurse examines the scratches on the runaway girl's face in the first music video. The first music video received its world premiere on 17 July 2009 through U2's YouTube channel. Directed by David O'Reilly and designed by Jon Klassen, it is the band's first animated music video since 1995's "Hold Me, Thrill Me, Kiss Me, Kill Me", and is one of the few not to feature the band. It depicts several people in a city undergoing hardships, and the events that interconnect them and bring them happiness as they decide to make changes in their lives. The video was entered in the 2009 Ottawa International Animation Festival. The second music video was directed by Alex Courtes and produced by Malachy Mcanenny.While the O'Reilly video plays over the studio version of the song, the Courtes version is the single edit. It consists of a live performance taken from the U2 360° Tour, filmed at Camp Nou in Barcelona, Spain, on 2 July 2009. Q called "I'll Go Crazy If I Don't Go Crazy Tonight" the band's "most unabashed pop song since 'Sweetest Thing'". while Mojo labelled it a "superficial pop anthem formed around a dainty kernel of pure melodic gold", calling the performance "[s]o cumulatively devastating is the band's delivery that it ennobles the succession of cute self-referential Bono homilies". Blender likened the "I'll Go Crazy If I Don't Go Crazy Tonight"'s piano parts to the hook of the Journey song "Faithfully", while Rolling Stone noted that the lyrics reflected Bono's inability to meet his own ideals. Rolling Stone also likened the "harrowing" beginning of the O'Reilly video to a Disney film, calling the animation "incredible". Eoin Butler, writing in The Irish Times' The Ticket supplement, was less enthused about the release, labelling it U2's "most lacklustre offering to date". The song was nominated in the categories "Best Rock Performance by a Duo or Group With Vocals" and "Best Rock Song" for the 52nd Grammy Awards in 2010. In promotion "I'll Go Crazy If I Don't Go Crazy Tonight" was used in television commercials for a Blackberry application, called the "U2 Mobile App", which was developed as part of Research in Motion's sponsorship of the U2 360° Tour. All lyrics written by Bono, all music composed by U2, except "Magnificent" (music also by Brian Eno and Danny Lanois, and lyrics also by the Edge). Credits adapted from No Line on the Horizon liner notes. 1 2 3 "I'll Go Crazy If I Don't Go Crazy Tonight". Amazon.com. 25 August 2009. Retrieved 2 December 2010. 1 2 3 4 "'Crazy' set for September 7th". U2.com. 25 August 2009. Retrieved 26 August 2009. 1 2 3 Universal Music Group (30 July 2009). 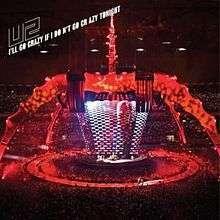 "U2 - I'll Go Crazy If I Don't Go Crazy Tonight: Live Action Version, Single Edit". YouTube. Retrieved 7 August 2009. ↑ "U2 Preview New Album to Q". Q. Retrieved 25 December 2008. 1 2 Frenette, Brad (10 March 2009). "U2's No Line On The Horizon: A track-by-track exclusive with producer/co-writer Daniel Lanois". National Post. Archived from the original on 21 October 2009. Retrieved 27 September 2009. ↑ Eccleston, Danny (26 February 2009). "Exclusive Adam Clayton Q&A!". Mojo. Retrieved 27 February 2009. 1 2 Hiatt, Brian (22 January 2009). "U2 Break Down 'No Line on the Horizon'". Rolling Stone. Retrieved 15 February 2009. ↑ O'Hagan, Sean (15 February 2009). "The Wanderers". The Guardian. London. Retrieved 15 February 2009. ↑ "Q Magazine previews new U2 record" (reprint). Q. 26 December 2008. Retrieved 9 September 2009. ↑ Mühlbradt, Matthias; Axver, André (4 March 2009). "2009-03-04: Ed Sullivan Theater - New York, New York, USA". U2Gigs.com. Retrieved 20 August 2009. ↑ Mühlbradt, Matthias; Axver, André. "I'll Go Crazy If I Don't Go Crazy Tonight". U2Gigs.com. Retrieved 20 August 2009. ↑ Austin, Steve (17 September 2009). "Review - U2 360 Tour - Toronto - Night One - Sept. 16, 2009". CityNews. Retrieved 26 September 2009. ↑ McCormick, Neil (17 August 2009). "U2: Secrets of Stadium Rock". The Telegraph. London. Retrieved 17 August 2009. 1 2 Mühlbradt, Matthias; Axver, André (2 July 2009). "2009-07-02: Camp Nou - Barcelona, Spain". U2Gigs.com. Retrieved 7 August 2009. ↑ U2 official (17 July 2009). "U2 - I'll Go Crazy If I Don't Go Crazy Tonight". YouTube. Retrieved 21 July 2009. ↑ I'll Go Crazy If I Don't Go Crazy Tonight (Digital liner notes). U2. Interscope Records. iTunes 00602527175669. 1 2 3 Kreps, Daniel (22 July 2009). "U2 Unveil "I'll Go Crazy If I Don't Go Crazy Tonight" Animated Video". Rolling Stone. Retrieved 7 August 2009. ↑ "Ottawa International Animation Festival: 2009 Selections". Ottawa International Animation Festival. Retrieved 7 August 2009. ↑ Rees, Paul (25 February 2009). "U2 No Line on the Horizon" (reprint). Q. Retrieved 25 February 2009. ↑ Cameron, Keith (25 February 2009). "Blue Sky Thinking" (reprint). Mojo. Retrieved 23 August 2009. ↑ Sheffield, Rob (28 February 2009). "No Line on the Horizon". Blender. Retrieved 23 August 2009. ↑ Fricke, David (20 February 2009). "No Line on the Horizon". Rolling Stone. Retrieved 23 August 2009. ↑ "Shuffle". IrishTimes.com. 8 August 2009. Retrieved 31 August 2009. ↑ "The 52nd Annual Grammy Awards Nomination List". Grammy.com. Archived from the original on 3 December 2009. Retrieved 3 December 2009. ↑ Cross, Alan (2 July 2009). "What Blackberry Has in Store for U2". ExploreMusic. Retrieved 4 July 2009. 1 2 "I'll Go Crazy If I Don't Go Crazy Tonight (Live At The Somerville Theatre, Boston - Recorded In March 2009)". Amazon.com. 25 August 2009. Retrieved 2 December 2010. 1 2 "I'll Go Crazy If I Don't Go Crazy Tonight". iTunes Store. 29 August 2009. Retrieved 29 August 2009. ↑ I'll Go Crazy If I Don't Go Crazy Tonight (CD). U2. Island Records. 2009. GOCRAZYCJ1. ↑ I'll Go Crazy If I Don't Go Crazy Tonight (CD). U2. Interscope Records. 2009. INTR-12601-2. ↑ I'll Go Crazy If I Don't Go Crazy Tonight (Dirty South Mix) (CD). U2. Interscope Records. 2009. INTR-12601-2. ↑ I'll Go Crazy If I Don't Go Crazy Tonight (7-inch). U2. Mercury Records. 2009. 2716223. ↑ I'll Go Crazy If I Don't Go Crazy Tonight (12-inch). U2. Interscope Records. 2009. B0013377-11. ↑ I'll Go Crazy If I Don't Go Crazy Tonight (CD). U2. Interscope Records. 2009. B0013376-22. ↑ I'll Go Crazy If I Don't Go Crazy Tonight (CD). U2. Mercury Records. 2009. 2716225. ↑ I'll Go Crazy If I Don't Go Crazy Tonight (CD). U2. Mercury Records. 2009. 2716226, 2717700. ↑ No Line on the Horizon (liner notes). U2. Mercury Records, Island Records. 2009. ↑ "Austriancharts.at – U2 – I'll Go Crazy If I Don't Go Crazy Tonight" (in German). Ö3 Austria Top 40. Retrieved 7 June 2014. ↑ "Ultratop.be – U2 – I'll Go Crazy If I Don't Go Crazy Tonight" (in Dutch). Ultratop 50. Retrieved 7 June 2014. ↑ "Ultratop.be – U2 – I'll Go Crazy If I Don't Go Crazy Tonight" (in French). Ultratop 50. Retrieved 7 June 2014. ↑ "U2 – Chart history" Canadian Hot 100 for U2. Retrieved 7 June 2014. ↑ "Single: Top 20 (for the week ending 19 November 2009)". Nielsen SoundScan. 15 November 2009. Archived from the original on 21 November 2009. ↑ "Lescharts.com – U2 – I'll Go Crazy If I Don't Go Crazy Tonight" (in French). Les classement single. Retrieved 7 June 2014. ↑ "Offiziellecharts.de – U2 – I'll Go Crazy If I Don't Go Crazy Tonight". GfK Entertainment Charts. Retrieved 7 June 2014. ↑ "Chart Track: Week 37, 2009". Irish Singles Chart. Retrieved 7 June 2014. ↑ "Dutchcharts.nl – U2 – I'll Go Crazy If I Don't Go Crazy Tonight" (in Dutch). Single Top 100. Retrieved 7 June 2014. ↑ "Spanishcharts.com – U2 – I'll Go Crazy If I Don't Go Crazy Tonight" Canciones Top 50. Retrieved 7 June 2014. ↑ "Swedishcharts.com – U2 – I'll Go Crazy If I Don't Go Crazy Tonight". Singles Top 100. Retrieved 7 June 2014. ↑ "Swisscharts.com – U2 – I'll Go Crazy If I Don't Go Crazy Tonight". Swiss Singles Chart. Retrieved 7 June 2014. ↑ "Archive Chart: 2009-09-19" UK Singles Chart. Retrieved 7 June 2014. ↑ "U2 – Chart history" Billboard Adult Alternative Songs for U2. Retrieved 7 June 2014. ↑ "U2 – Chart history" Billboard Adult Pop Songs for U2. Retrieved 7 June 2014. ↑ "U2 – Chart history" Billboard Alternative Songs for U2. Retrieved 7 June 2014. ↑ "U2 – Chart history" Billboard Hot Rock Songs for U2. Retrieved 7 June 2014.